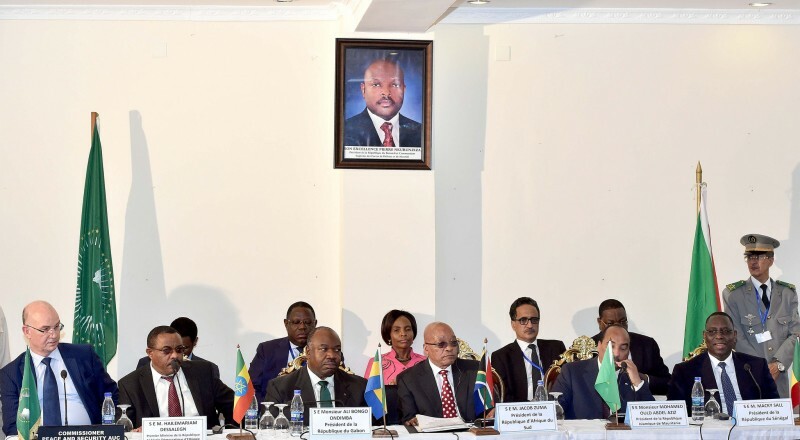 South African President Jacob Zuma (front row, center) visits Burundi, February 25, 2016. Photo Credit: GovernmentZA. Flickr, CC license. On May 17, 2018, Burundians will go to the polls to vote on proposed constitutional amendments. Voters will be asked to vote ‘Yes’ or ‘No’ on changes that include extending the presidential terms to seven years and restarting the count that might help current President Pierre Nkurunziza to remain in power until 2034. Burundi's current constitution has been in place since 2005, and largely regarded along with the Arusha Accord  as a covenant that ended the country’s civil war, ushering President Nkurunziza into power in 2005. Tension regarding apparent bias and coercion in the referendum campaigning process has reflected ongoing political disputes within the East African nation. ‘Yes’ and ‘No’ campaigns have picked up steam in the official two-week campaign period which ends on May 14, 2018. But campaigning before or after this official period  or by non-registered  groups was strictly forbidden. However, opponents of the constitutional amendment complain  that for months government officials  have backed the ‘Yes’  campaign, led by the ruling party and joined  by others such as the officially-recognized branch of UPRONA  (Union for National Progress). Vice-president Joseph Butore said  it was the “will of the people”, and President Nkurunziza  promised  it is “God’s will” to free  Burundi from foreign colonizers  for a better  future . He encouraged  supporters to vote freely, although officials  also warned  against “sabotaging” the vote and told people to report  suspects to police. Agathon Rwasa, head of the Amizero y’Abarundi coalition, supports the ‘No’  campaign, insisting that the referendum does not represent the people and could possibly install an authoritarian  regime. The unrecognized UPRONA joined this campaign, as did the Front for Democracy in Burundi (FRODEBU)  which argues against the referendum to protect the Arusha Accord, mediated dialogue, and avoid  a one-party state. Nkurunziza's announcement  that he would serve as the ruling party’s ‘Supreme Guide’  sparked worry of authoritarianism among critics. Opponents of the amendment are divided, though. Those remaining in Burundi largely back ‘No’ although some dissenters back  ‘Yes’. Meanwhile, exiled opposition members centered around the National Council for the Respect of the Arusha Accord and the Peace and Reconciliation of Burundi (CNARED) support  a boycott . Some supporters in exile express frustration  with these divisions. In April 2018, Human Rights Watch  described “lawlessness”  in the country. International Crisis Group criticized a “campaign of intimidation ” leading  up the referendum , including  arrests  and  even  deaths  of those accused  of opposing  the referendum. Officials reject  this as mendacious to tarnish Burundi’s image. The International Federation for Human Rights also criticized  media  coverage biased  in favor of the ‘Yes’ camp. Leading up the referendum, citizens report significant pressure to register  to vote, to refrain from voting “No” or boycotting the referendum altogether. Controversy also surrounds reports of coerced  citizen  “contributions ” to  finance  elections . SOS Médias Burundi, an underground journalist collective, used their Facebook page to report  many arrests  and intimidating acts , such as a video  of a member of the National Council for the Defense of Democracy-Forces for the Defense of Democracy (CNDD-FDD) threatening to “break the teeth” of ‘No’ campaigners. Tight  restrictions  on media  have continued throughout  this campaign . The National Communications Council (CNC) recently suspended  the British Broadcasting Corporation (BBC)  accused  of threatening “national cohesion”, and Voice of America (VOA)  for six months . Reporters Sans Frontières (Reporters without Borders) criticized  the clampdown as another attack on press freedom, particularly to restrict debate on the referendum as both hold radio shows in the Kirundi language, making them widely accessible. The CNC also cautioned Radio France International (RFI) and local radios  Isanganiro and CCIB FM+, and in April suspended  Iwacu newspaper’s online comments  section for three months . Sign of independence or return to a one-party state? Tensions have run high since 2015 when President Nkurunziza's third term – widely seen as prohibited by the 2005 constitution and Arusha Accord — sparked protests, a failed coup, and rebellion. As a result, many members of the opposition, ruling CNDD-FDD party dissenters, and journalists fled abroad while others were internally displaced. While thousands  have returned  since 2017, the United Nations (UN) has still registered 396,000  refugees since 2015 at under funded  refugee camps. Ministers claim these figures  are manipulated. Since 2015, local  and international  rights monitors have criticized  repression , impunity , and restrictions  on media  and activists  by security services and the CNDD-FDD “Imbonerakure ” youth-wing. Several radios  were closed and journalists harassed , even disappeared . Recently, rights activist  Germain  Rukiki  received a heavy prison sentence  for “threatening state security”. A 2017 UN Commission of Inquiry  report  said crimes against humanity may have occurred and saw no improvement by March. The government rejected these claims. The International Criminal Court opened an ongoing investigation,  which continues despite Burundi's government leaving the court . Political insecurity  has hit economically , bringing austerity  budgets, energy shortages , and inflation . A UN report  in February estimated that those needing humanitarian assistance  in 2018 rose to 3.6 million. International responses have been lackluster and divided , with mediated  dialogue  ineffective . Sanctions have amplified economic stress and the crisis has stretched  relations  with neighboring Rwanda in particular. France , United States , and the European Union  expressed  concern  over insecurity and repression  around  the referendum. Yet, Burundi’s UN Ambassador, Albert Shingiro, said governments should respect  sovereignty. The influential Catholic Church  said it was not the moment to amend the constitution, given the ongoing insecurity and many refugees unable to vote. Government supporters argue that the referendum demonstrates independence from Western interference. Officials minimized the reforms, saying they only affect part of the constitution. Opponents  expect ‘Yes’ to win, but fear it legally consolidates an “eternal president” and the return of a one-party state. Either way, the referendum appears to have further cemented divisions while pressing political and economic challenges persist.